Women’s Weightlifting Week returns to UNC Asheville this week. Different events take place throughout the week and open to anyone with a Onecard. Once an individual attends three different events during the week, they will receive their choice of a pair of socks or a Women’s Weightlifting Week shirt. “We have about 25 events this year starting on Monday, March 26 until Friday, March 30 and I think about eight or nine of them are lectures like ‘Confidence in the Gym’ and ‘Navigating Gym Culture’,” Dailey said. Students, faculty and staff interested in health and fitness lead the events. Associate Director of Fitness and Facilities of Campus Recreation Aleen Dailey started Women’s Weightlifting Week in 2016. Other practical events will be offered, Dailey said, including learning how to build your own gym guide as well as an event called ‘Everyday Home Workout’ designed to help students do workouts at home or on vacation when students cannot access the gym as often as they may want. Dailey said she wants everyone to have the opportunity to learn about the equipment within a gym and within their own bodies. Senior health and wellness student Katie Nissley said she wants to communicate Women’s Weightlifting Week does not strictly focus on the equipment at the gym. Nissley said she hopes to encourage individuals to understand what is going on with their bodies while they are exercising. 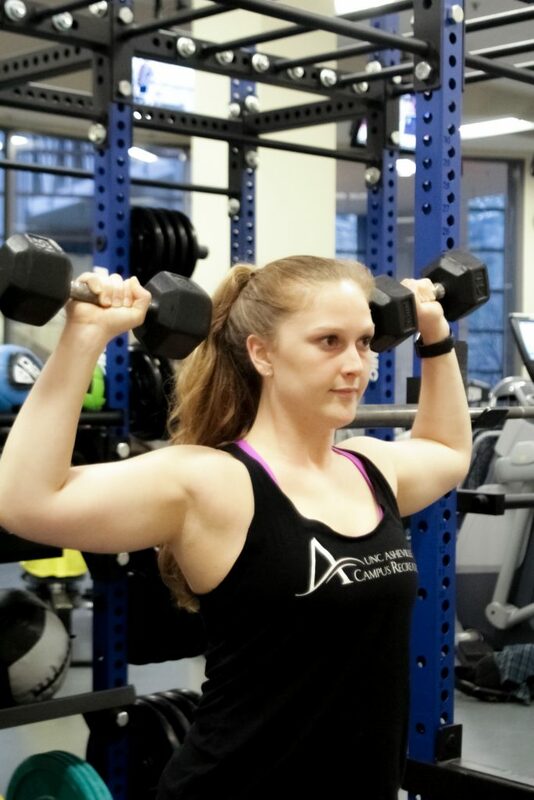 Dailey and fitness instructors like Nissley who participate in Women’s Weightlifting Week said they notice some women limit themselves to mainly the cardio area of the gym. They said they want women and all individuals to know all parts of the gym can benefit their bodies. Junior health and wellness student Eva Hill will be involved with Women’s Weightlifting Week by leading a number of events throughout the week focusing on various operations of gym equipment that may typically intimidate some people. “I am teaching a bunch of different classes during Women’s Weightlifting Week in the gym on how to use different weight equipment. I have been using the gym for about eight years now,” Hill said. Hill said she has been surrounded by weightlifting for a large portion of her life and wants to encourage others to learn and enjoy weightlifting the way she does. Women’s Weightlifting Week encourages the use of the gym. Nissley shared that as an instructor, her main goal is to teach people to not be intimidated by the weights in the gym. She wants students to not be intimidated to come to the workshops throughout Women’s Weightlifting Week. “Once you start doing it you will realize how powerful you feel and how much it motivates you to be healthy,” Nissley said.